Data loss can occur from theft, disasters, or human error. Regardless of how data loss occurs it is important to have a backup plan to retrieve the data. An organizational disaster recovery plan may be in place, but what about the smaller amounts of data that can disappear from stolen laptops, a forgotten nightly backup, or a sudden hard drive crash? In the world of the cloud, data recovery is not typically a problem, but it does happen and you need to be prepared. Backups come in many different formats. Cloud backups can save your organizational data. Private clouds may back up your day-to-day records, while public clouds may save all other data. Coding, patient records, tax records and other highly important pieces of data may have multiple storage locations. It is not uncommon for enterprise-sized corporations to have multiple data centers, one local, and one or more strewn throughout the country via different cloud service providers. This redundancy in data storage is to safeguard records from any mishaps. 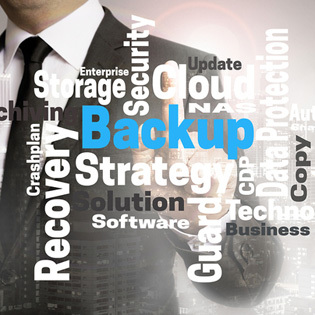 Backup strategies are about more than relying on cloud services to protect your data. In a world where IoT (Internet of Things) is constantly growing it has become imperative for IT departments to track data from multiple devices. Confidential data can be on laptops and tablets, and important information may be shared through smartphone texting. Video conferencing through applications like Skype and Facetime may not be company policy, but employees often do whatever is most convenient at the time. Subscribe to the TOSS C3 blog to find out more about storage solutions and backup strategies for your industry. Since data can take the form of text, video, or audio files, it becomes the responsibility of the IT department to come up with multiple backup strategies for all incoming formats across several devices. Determining your backup needs is the first aspect of a solid storage solution. The media type must be determined as well as access rights, individual department needs, and security. Day-to day operations may not need solid security, especially if the data is not confidential in nature and it does not have client information. On the other hand, if you are part of an accounting firm, medical facility, or insurance company, then there may be laws in place designed to ensure patient or client data is secured in a specific way. Bandwidth and potential storage capacities are other factors to consider when thinking about storage solutions. This is one of the reasons more companies are relying on multiple cloud vendors for storage solutions. If your company is equipped with a portal that is accessible via the Internet then client data must be stored, have the ability to be altered, be secured against hackers, and have the capabilities to store thousands or millions of names. Since this type of data is stored via databases it may not be too large in physical size but with more applications equipped with add-ons, it can take some room on servers. This is especially true if you are using a virtual server, which can add another layer to your storage needs. The virtual machines use less hard drive space but require more memory, but the real-time data needs to be stored immediately to protect the contents from hackers or hardware mishaps. Longevity – Look for providers that have been around for awhile and that have a solid customer base in your industry. Some forms of data must be stored forever, literally. The provider must have a solid data recovery plan in place in case something happens to your data. This may mean they store the data in different data centers, and that is fine. You may also want to store forever-data with multiple providers. Also, find out what your provider’s policy is on retrieving data if you decide to leave them and join a different provider. Accessibility – Ask your cloud provider about up-time. In today’s market, they should be able to promise you at least the five-nines (99.999%). Data streamed from multiple devices cannot afford to be interrupted by bad service. You may also want to check your SLA to make sure their promises are in writing. If it is not in the contract, then it is not guaranteed. Cost – This is a tricky one. To get the best storage solutions you will have to look at paying the cost. If data runs your company you need to take care of it. Management – Managing storage devices should be easy for those with access. You do not want data accessed by all your team members. However, security should be balanced; for example, it’s important to ensure that even if a key person leaves the company, you will still have access to your own data. Administrative monitoring solutions can help to get the right access to the heads of the right departments, and it will monitor who adds, deletes, or changes data in real time. Data recovery and storage solutions can be a headache, but if you can trust your cloud service provider to do their job, then your job will become much easier. Find a provider with experience in handling data in your industry, and make sure all guarantees are in writing. Look for other providers to act as secondary storage tanks to protect your data from all matters of concern. Get a free assessment, and see how TOSS can help you with all your storage solutions.